Many apologies for lagging behind, but once again this good weather has been spent in the field and that’s what it’s all about. Not that your missing anything, as everything should be better over the next few weeks. Those jolly old souls at the met office would have us all believe light cloud would dominate the landscape last Thursday, with perhaps the odd sunny spell. That forecast postponed a return to Latchmore with Steve Covey, who quite-rightly probably uttered a few obscenities at the realisation that it turned out to be wall-to-wall sunshine. A change of plan then, and an opportunity to indulge in some well-deserved peace and quiet at Ober Water. No politics, no crowds (not a soul) and a fine array to keep me occupied from Markway to Clumber. 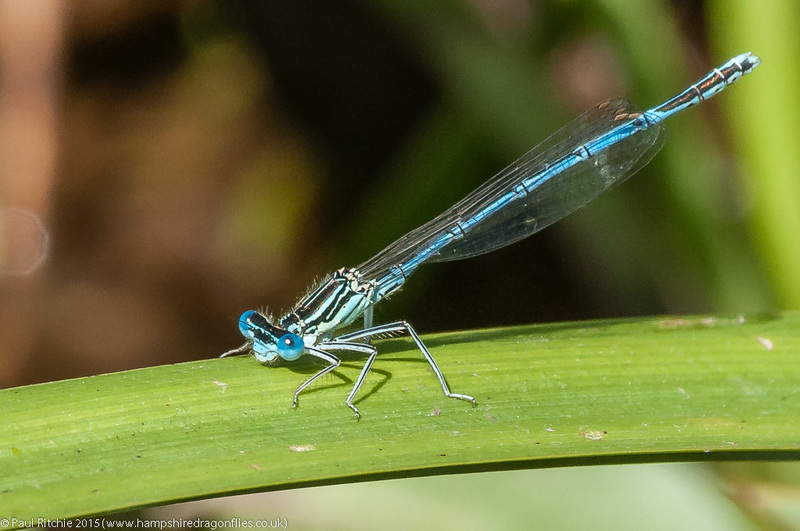 Coincidentally the very first damsel I came across was a male Scarce Blue-tailed; notable for it’s close proximity to Markway Bridge – further upstream than they usually appear. Also in good numbers for the whole walk were White-legged; surprisingly outnumbering the Southern today. As usual most of the unattached females and immature/tenerals were holed up away from the water. 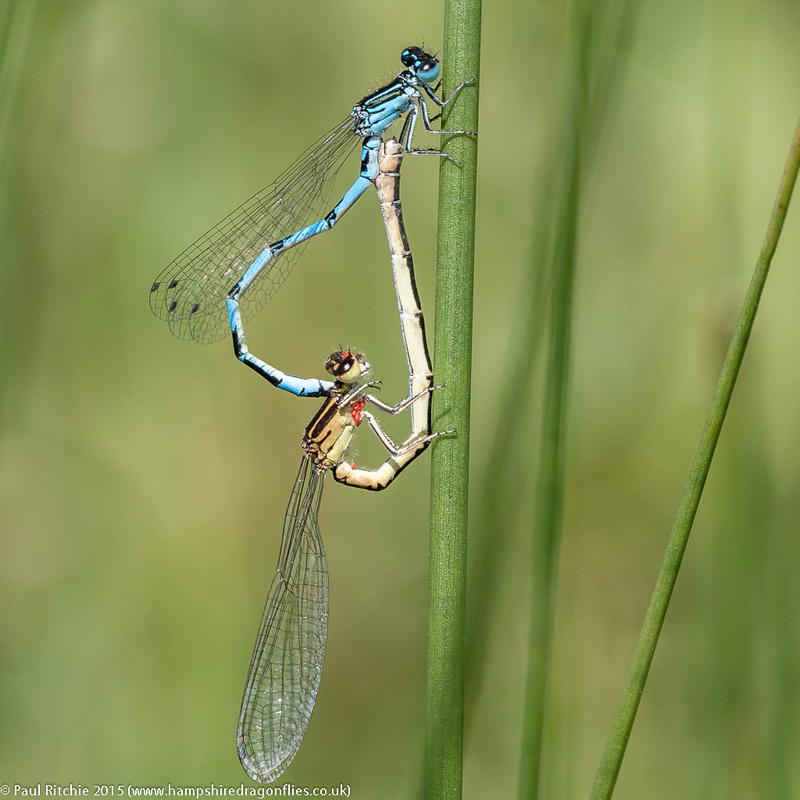 These were joined by (common) Blue-tailed, Large and Small Red and reasonable numbers of Beautiful Demoiselles. I stayed at a favourite spot watching a male defend his terrtory and winning the desires of a female. 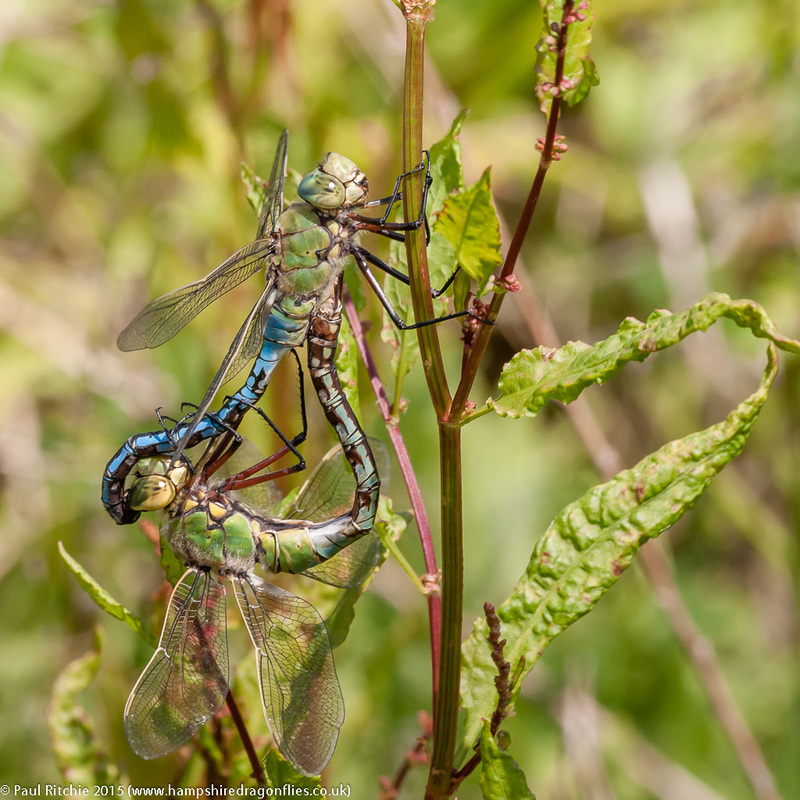 After a fine courtship dance, they paired for five minutes before she returned to the stream to oviposit while her mate protected her. Fifteen minutes later they paired again for another five minutes. A cracking piece of theater. 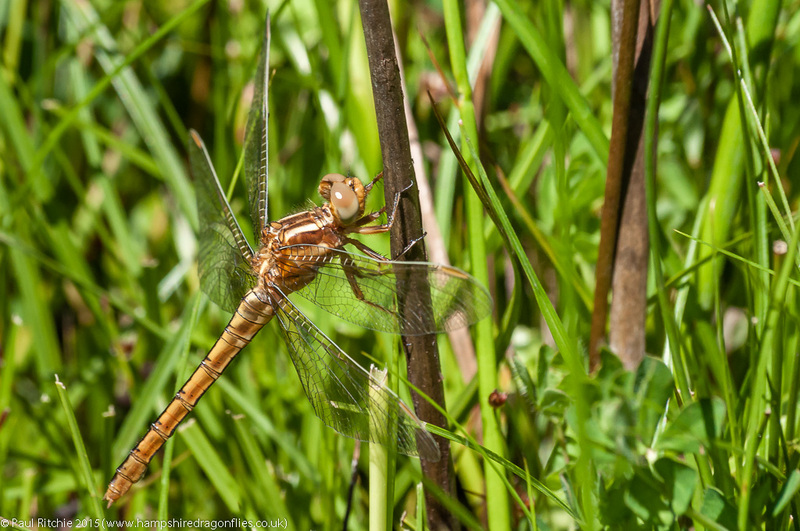 Keeled Skimmers were more abundant than last week, although still not at peak levels. Again it was away from the water where you could find the females. Of course it’s always a joy to see a Golden-ringed. 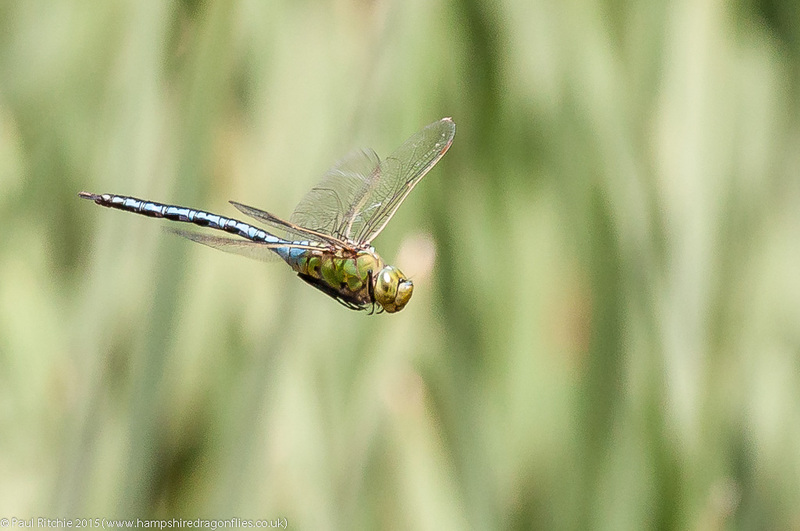 This young male was patrolling the busy area around the reeds. I find the majority of males rather friendly, and this one was no exception as he perched high in front of me. Now isn’t a natural perch better than pushing a stick into the stream? 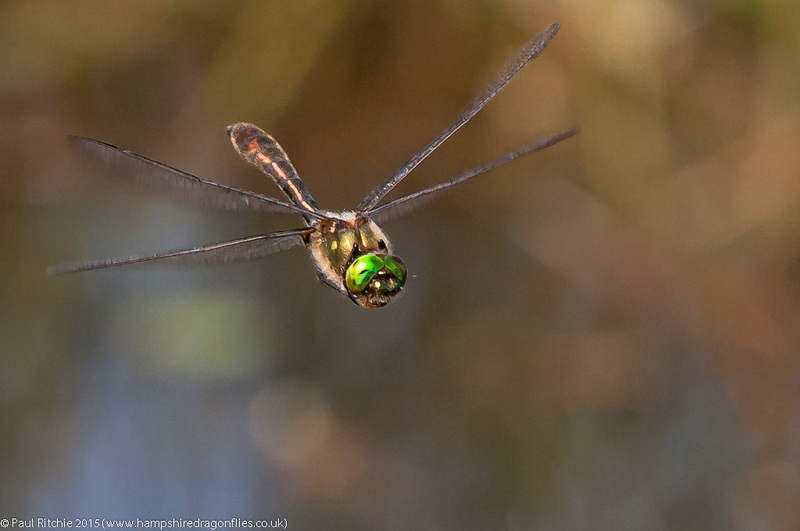 Coming Soon:- A weekend visit for the Green-eyed Hawker. A repeat visit was in order to check on the Scarce Blue-tailed situation. Although they’ve been out for a fortnight at Badminston, the cooler conditions here obviously affect emergence, resulting in a later showing this season. 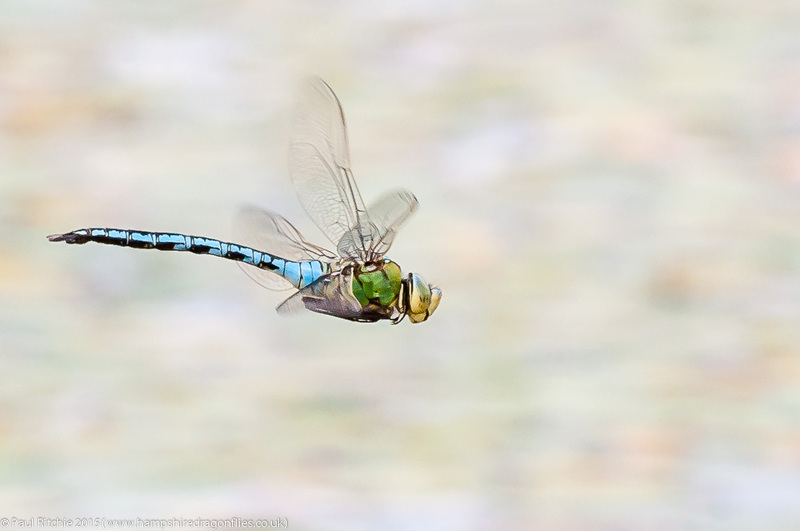 The populations of other species helps to confirm this theory, with Keeled Skimmer still surprisingly few. 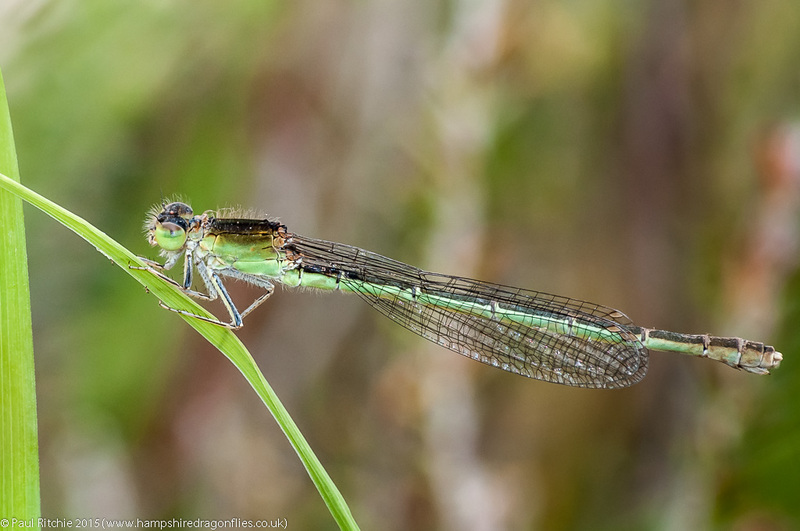 The main stream still isn’t showing any Golden-ringed, and the Demoiselles are only slightly more numerous than last week. 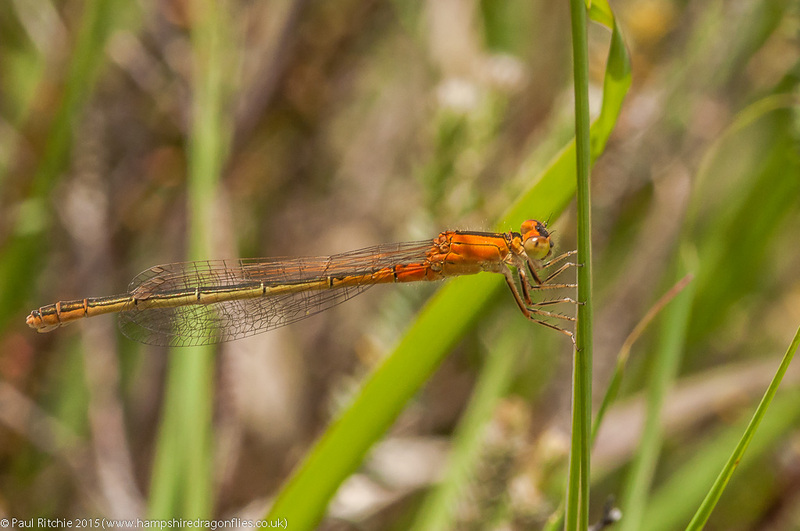 I didn’t see any male SBT in any of the flushes on the walk in, but neither did I see much else, so it was a nice surprise to come across my first aurantiaca relatively early. A nice teneral, almost pink before the diagnostic bright orange. As with last Thursday, Small Red were the dominant species; the Southern being surprisingly few with only the one male seen within the scrub. Not to worry – I was very single-minded today, and, despite the lack of males, that striking bright orange of the immature female form provided another welcome opportunity. Now I could quite happily post one after another, but I thought I’d post a selection of the various female phases. They start off pink then quickly turn to orange as in the above photos. Next they reach a transitional phase when they start to lose that striking orange. Finally they mature into a rather drab green, which I think is a shame, as we could all do with a little more colour in our lives. As stated the males were very few, but numbers did increase as the day went on, with a few occupying some of the lower channels near the main flow of the stream. Now regarding that stream. Latchmore Brook is in the process of some ‘redevelopment’ – reverting the main stream to the meandering course it took before being ‘straightened’ as an aid to pasture. 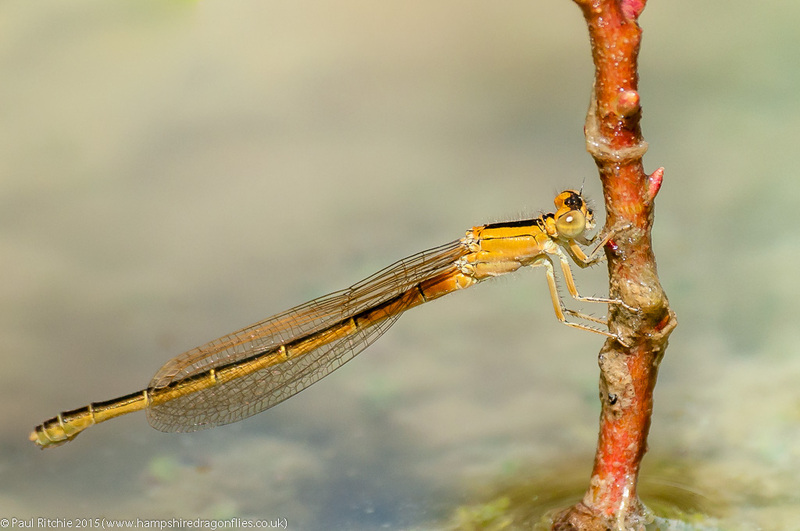 I have looked repeatedly at the proposals and as far as I’m concerned these works should benefit the resident odonata population by returning this stream to its original course. At the moment the main stream is mostly devoid of emerging flora and by association resident fauna. One only has to look at Ober Water to see how it should be. Allowing the stream to return to it’s original course will remedy this, and we should see a greater diversity and higher numbers along its length. The only problem I can foresee is damage caused through ignorance by the contractors, which I hope can be avoided by having an expert on site to advise. This has been arranged through a consultation involving several bodies brought on by the ‘Friends of Latchmore Brook’ campaign group. Our ‘friends’ should be happy with this, but in the spirit of all nimby activists they are never happy, and will never be until all prospected works seize and leave their beautiful dog walking patch alone. Personally I will be a lot happier if I can take a stroll down Latchmore without bumping into one of these doom-mongers accosting me and chanting ‘the end is nigh’. Respect my time and my peace and I will respect yours. I don’t need politics on a country stroll. When all’s said and done you might be able to chant ‘I told you so’. 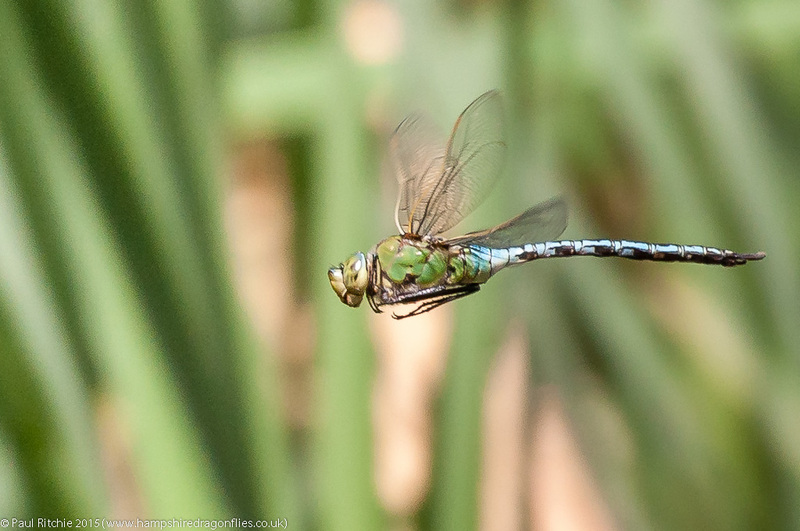 There is no conceivable explanation for the lack of dragonflies today. Beautiful, warm sunshine, a steady summer breeze. 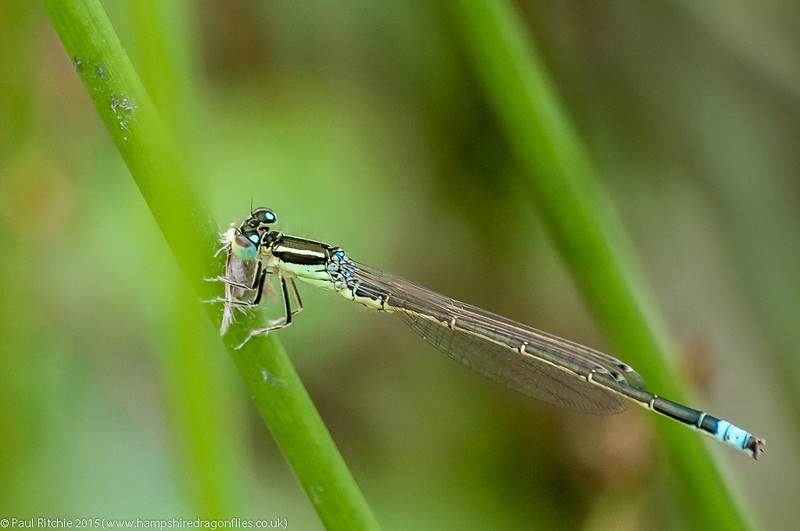 Even the main stream was disappointing; ust a couple of lonely male Beautiful Demoiselles and a couple of Azure. No Golden-ringed; no Emperor holding territory over the pool. The first flushes didn’t show any Scarce Blue-tailed; nor the next. The concrete circle didn’t have any flying and the heather and grasses were populated mostly by Small Red. We did eventually find a male each, and, after a fingertip search, Doug located a mating pair. 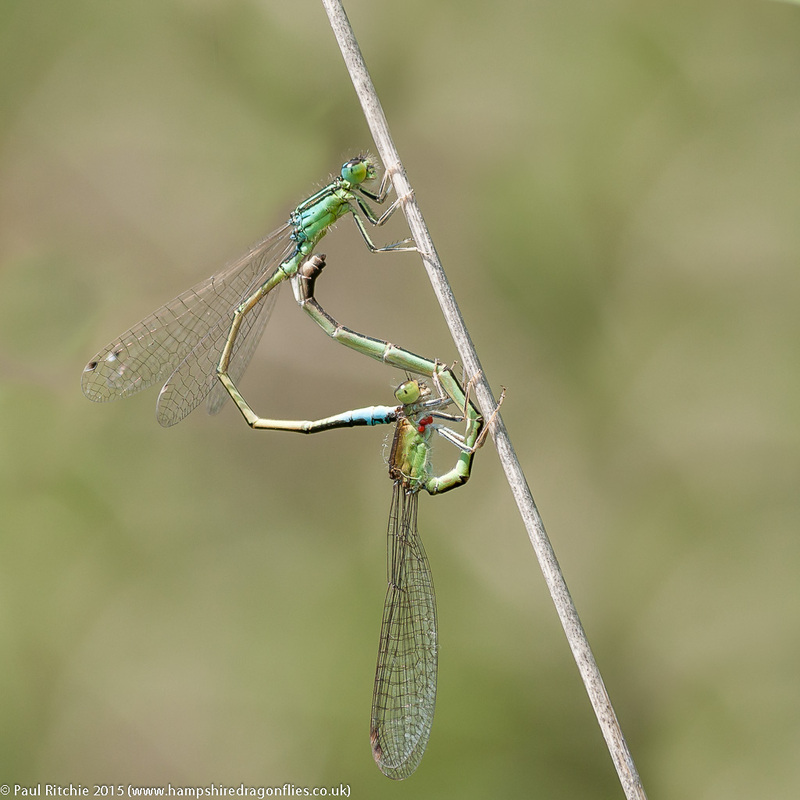 As you can see from these shots, the damsels are susceptible to mite infestation here. Some may choose to attempt to photoshop out such parasites, but it’s all part of nature, which isn’t always perfect. 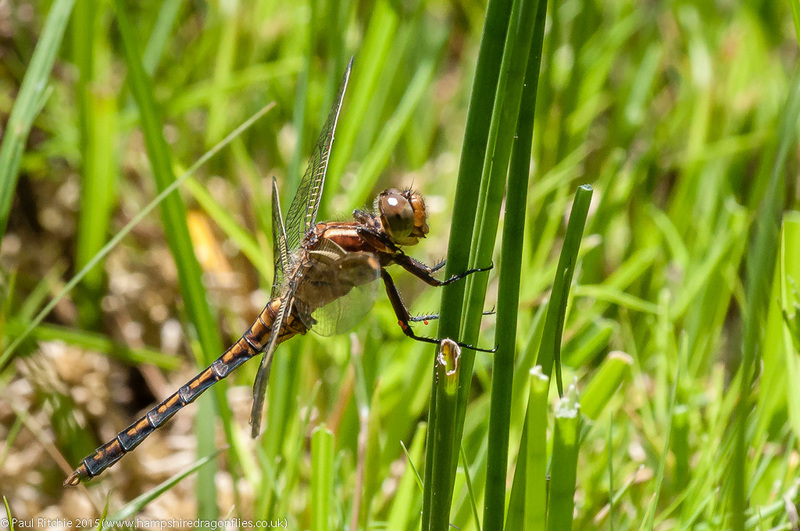 Also notable were the low numbers of Keeled Skimmers. Normally the heath is decorated with tenerals while mature males parade over water, but only the odd single male showed and another was protecting his mate as she oviposited. 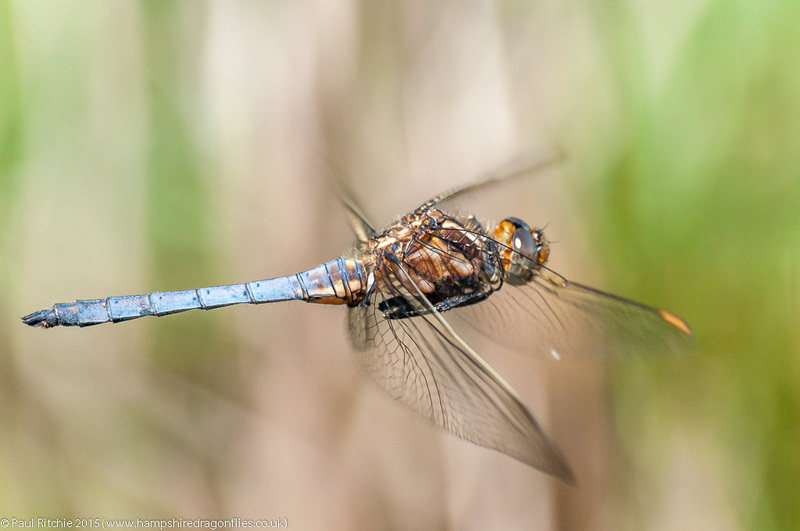 Occasionally we’d come across a fresh Common Darter, or the odd Broad-bodied Chaser. Even the Four-spotted were in short supply. After three hours we felt we’d had our fill, so decided to move on to Linwood where we at least should have some activity over-water? 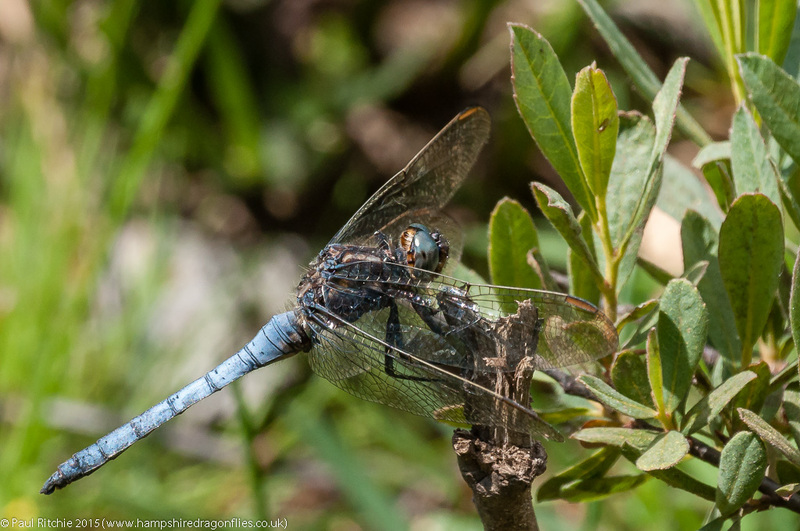 The walk in via the fern-strewn corner provided half-a-dozen hawking Emperors for our viewing pleasure, but the pond had only the one male and a pair of Broad-bodied Chasers. 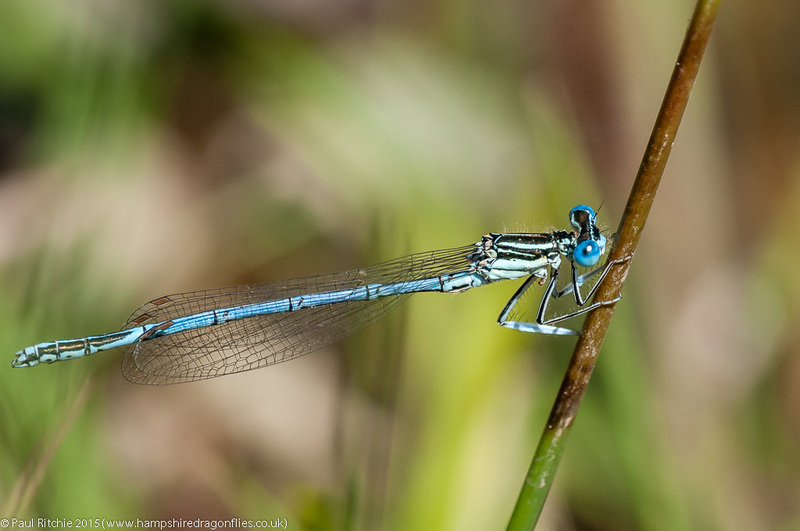 We decided to end the day at Burbush, which usually provides something, but besides a few Common Blue and Large Red, even the damsels were lacking. Not an Emerald to be found. 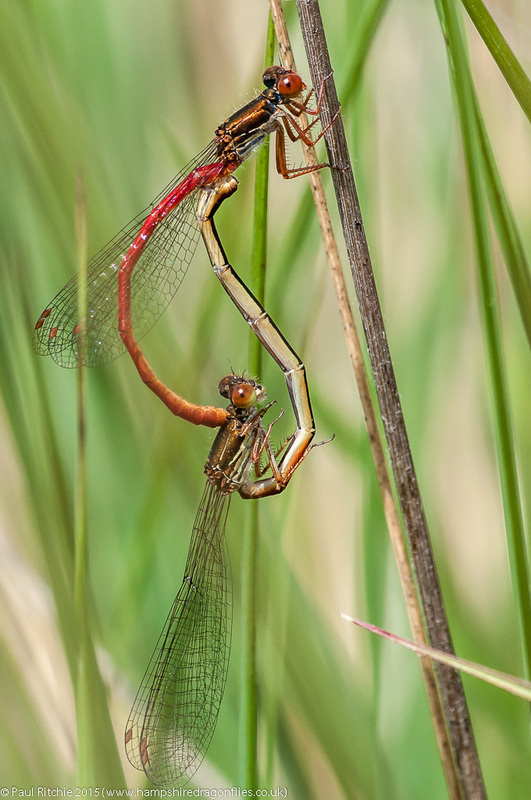 Just a couple of Common Darters and Broad-bodied Chasers resting up in the heath. On a day like today we should’ve had plenty more to keep us occupied, and, despite feeling a tad down at the lack of opportunities, I’m grateful for he shots I came home with. Mid-June’s the ideal time for a stroll across Christchurch (Town) Common, especially if the sun is bright and the wind is light. True to form these shallow, heathland pools have a tendency to dry out during summer, but this doesn’t appear to bother the resident breeding populations which thrive in such conditions. 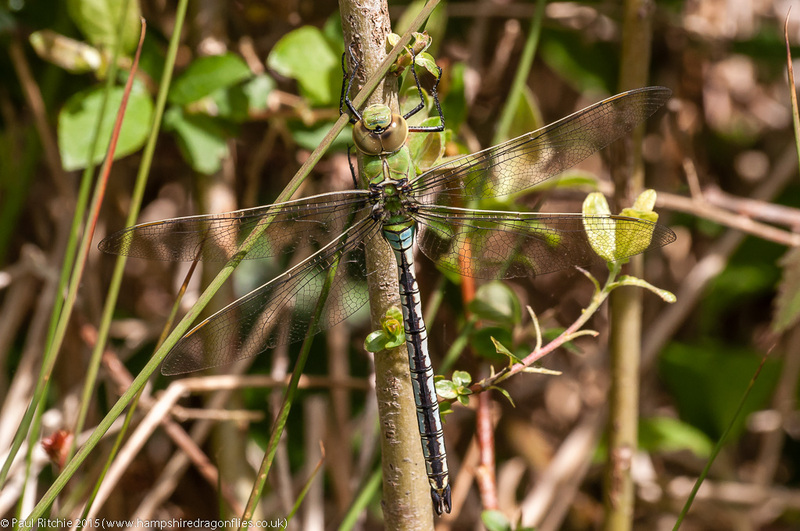 I’d barely stepped off the old railway track before I saw my first Black Darter of the year. 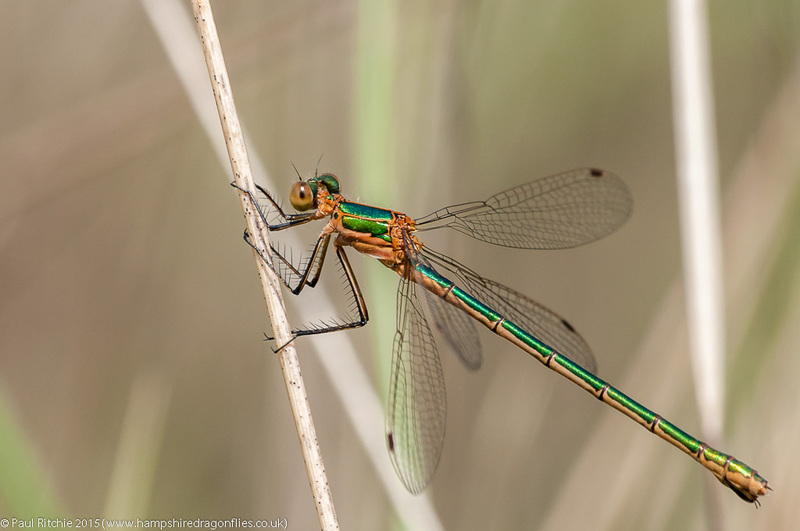 Sadly, and a little surprisingly, this proved to be my only sighting, but a good showing of Common Emeralds made up for this. 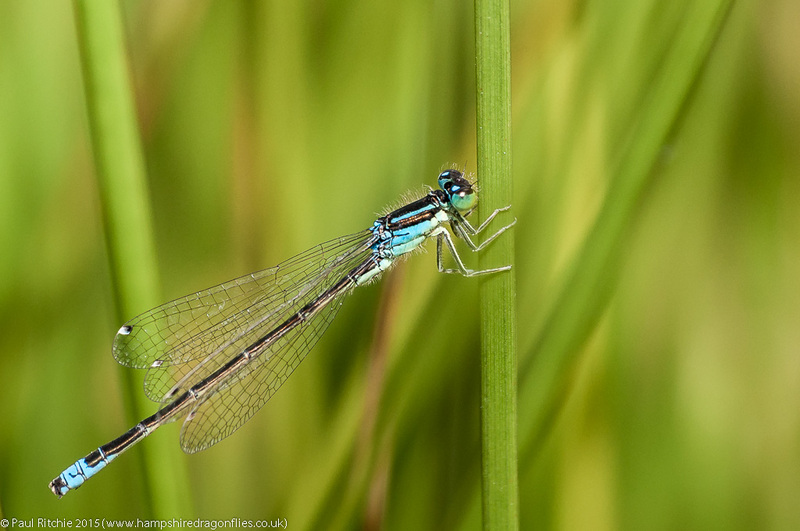 Both species share more or less all the pools on the heath, but there are three in particular which offer good opportunities for photography. 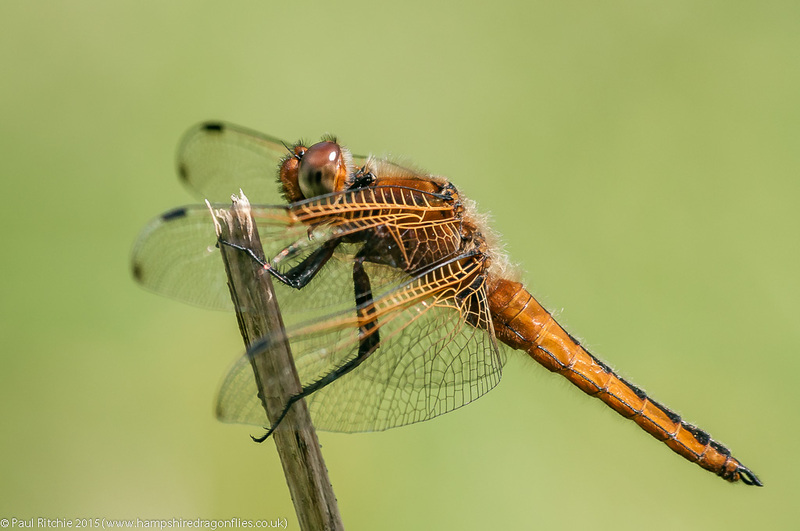 The third of these, a favourite of another as yet unmet enthusiast, has the best activity over water with the usual Emperor, Four-spotted and Brad-bodied Chaser, but it was the profusion of Small Reds which impressed today. One of the things I’ve noticed about the Small Red over the years is their adaptability to their surroundings, and seemingly a preference for one plant over another. 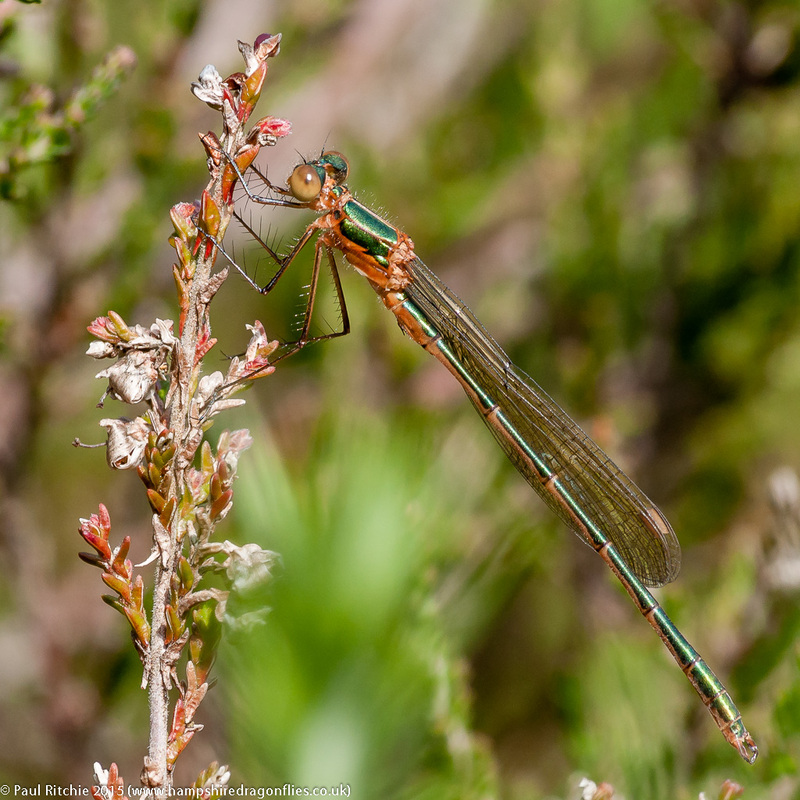 In the New Forest for instance they tend to congregate around Bog Myrtle lining the banks of Ober Water, Latchmore Brook and Crockford Stream. 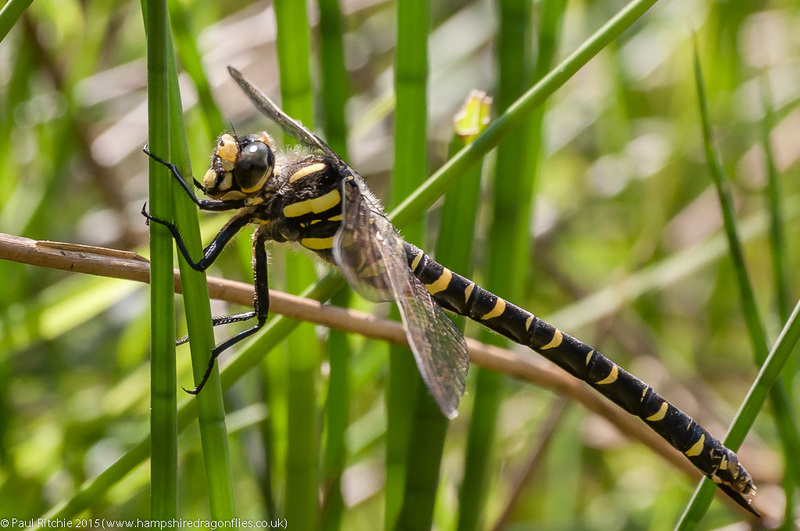 At Cadnam Common and Thursley the highest populations can be seen decorating the reeds and rushes. Here on Christchurch Common and other similar habitats, they all but ignore the surrounding heather and congregate among the long grasses. This does have a tendency to make photography more challenging; especially if there is a breeze. Despite my best efforts my chosen composition would be ruined by a stem or two blowing across my viewpoint just as the shutter released. After another session I suddenly lost all energy. Perhaps a little too long in the sun negotiating uneven ground, or just old age! I decided to return to the car and was all intent on calling it a day when a spark of inspiration gave me an extra blast of energy. Having just added three to my season’s count, why not add three more? 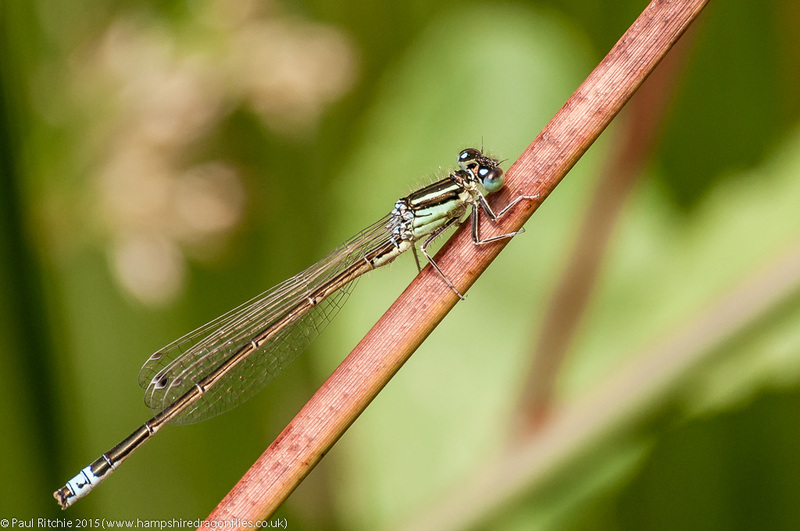 With this in mind I decided to take a stroll down Ober Water, where very soon the Southern Damselfly provided my fourth. The banks were surprisingly subdued with only a few individuals seen. 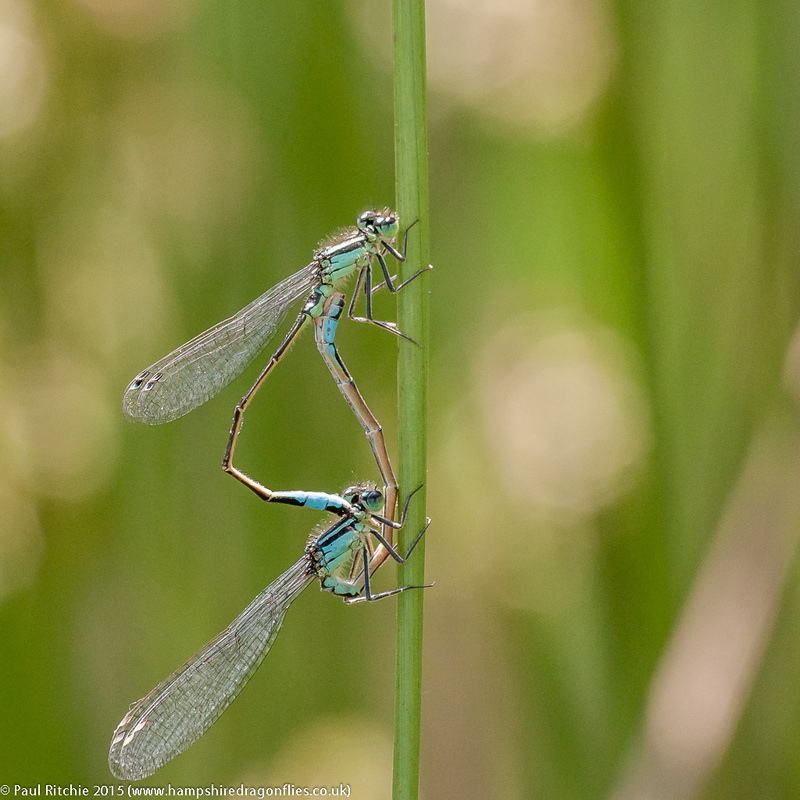 Even the Beautiful Demoiselles were few on the ground, with just a few pockets around the tall reeds providing their usual display. If anything the White-legged were matching their populations today. Number five then. 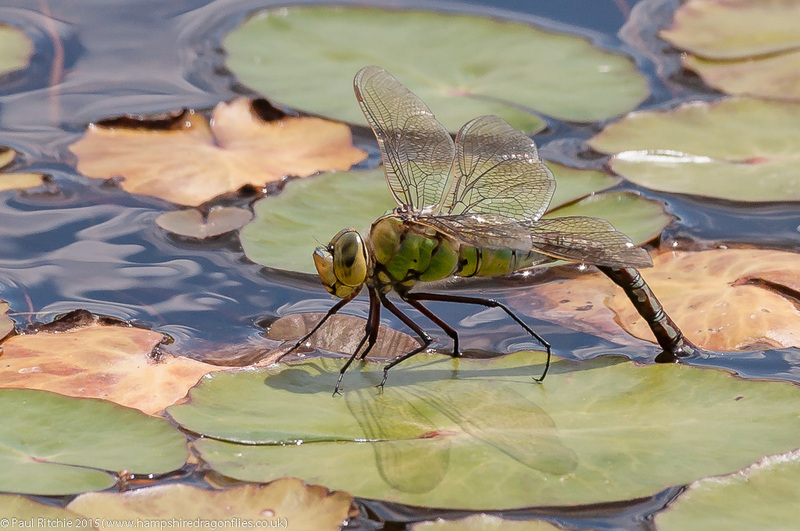 Now all I needed were those Keeled Skimmers, and Ober didn’t disappoint, except in numbers. Having bagged number six for the day I returned upstream and called it a day. 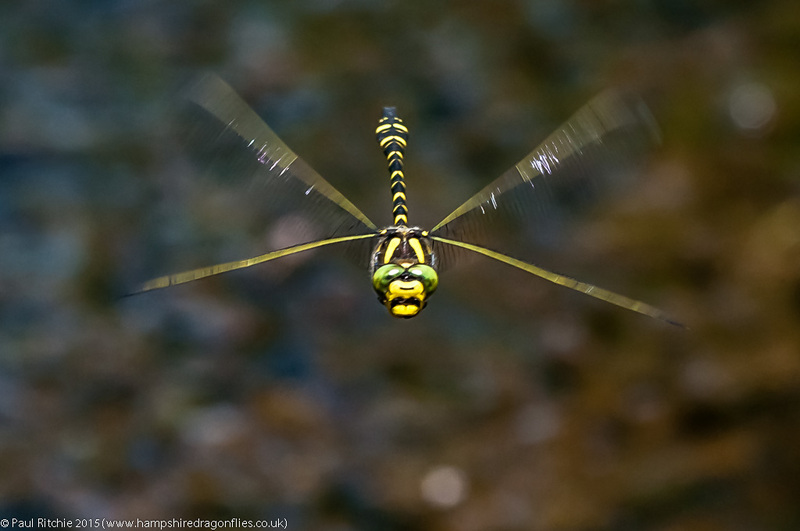 Early next month should see this fantastic stream come alive and provide one of the best summer dragonfly spectacles to be seen in the UK. PS:- I just looked back at my Christchurch Common visit last year around this time and noticed that I suffered a strange exhaustion on that occasion too. How very strange? Despite a dodgy forecast Sue and I visited a private site on Saturday in the hope that those South-westerly winds had brought in some migrants. Besides, it needed a revisit. We skirted the plateau, hoping to flush out some delights from the grasses and shrubs. 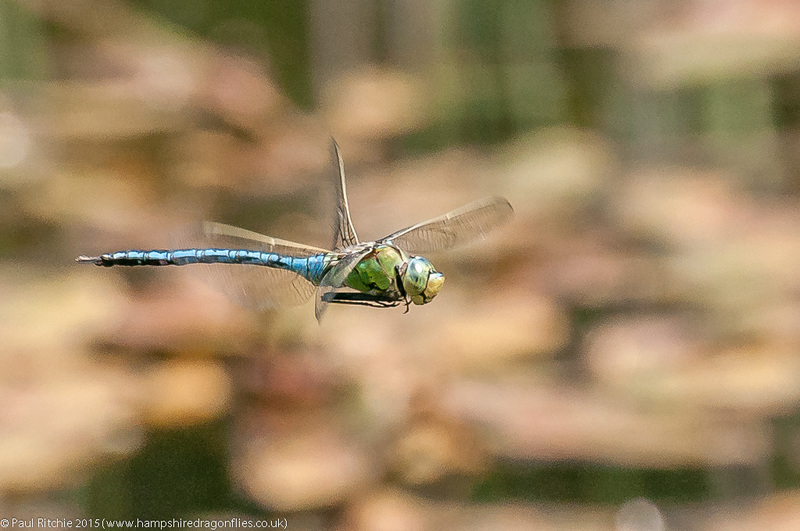 Plenty of Common Blue, Azure, Large Red and Blue-tailed damsels, and a few sheltering Four-spotted Chasers. 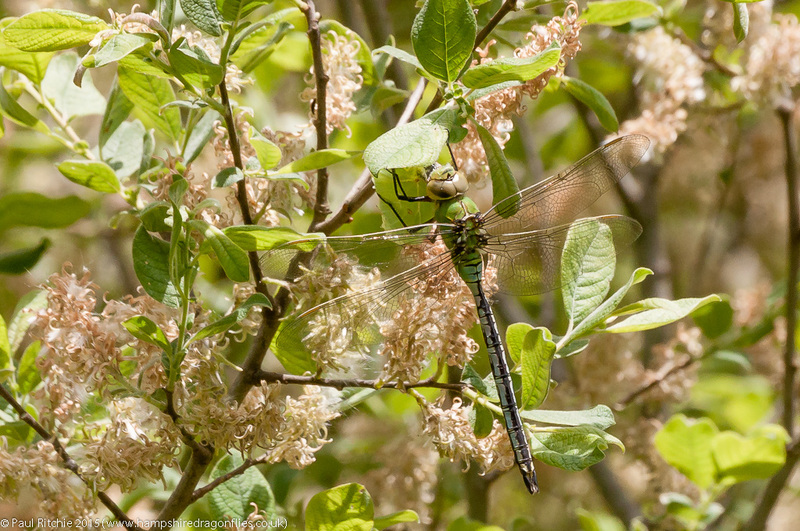 This meadow-like corner also provided our first Common Darters of the season. At an open area of the lagoon we had a patrolling male Emperor and a male Hairy – the latter fully at home in this labyrinth of saplings and reeds where he could disappear out of sight at will. 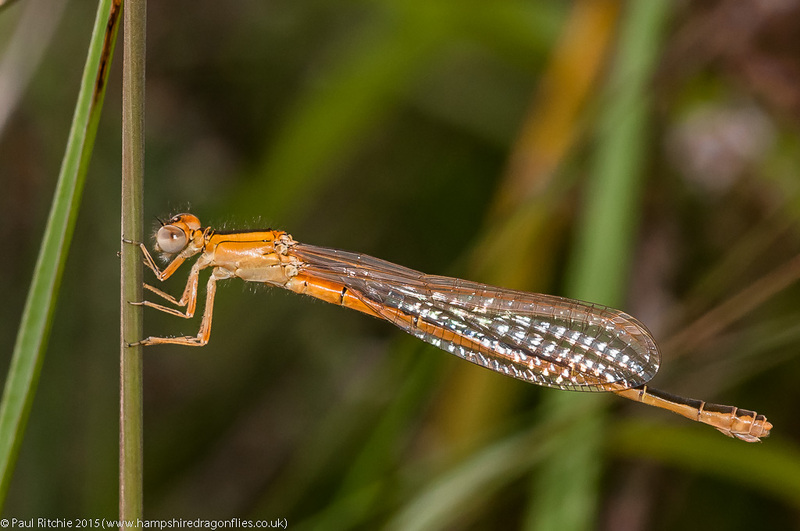 In comparison it was much easier to capture the damsels. Thwarted by attempts to find previous entry points, we returned to the plateau. Those productive, ephemeral pools had been replaced this season by long, deep drainage channels, but the SW corner still maintained the lagoon, increasingly over-taken by sapling growth. 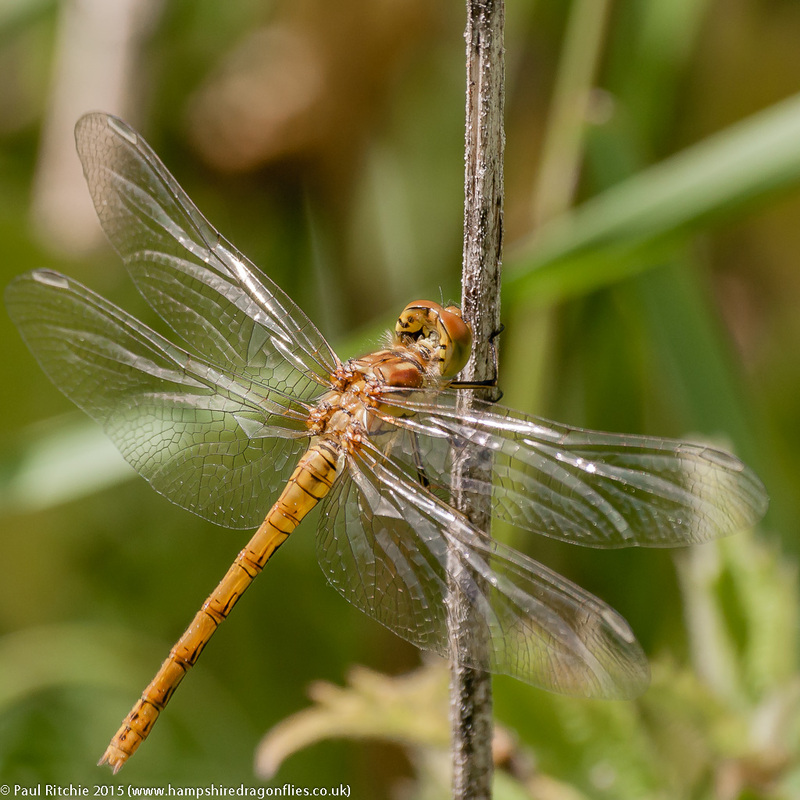 One small pool looked to be the most promising spot , and after a showing of a couple each of Black-tailed Skimmers and Four-spotted Chasers, we had an all-to-fleeting glimpse of a male Red-veined Darter engaging in a tussle before shooting off never to be seen again. I still find these hopeful, needle-in-a-haystack experiences highly frustrating and didn’t have the patience to remain transfixed on this small pool all afternoon. Thankfully just a short distance away was a small area with a good population of Scarce Blue-tailed. 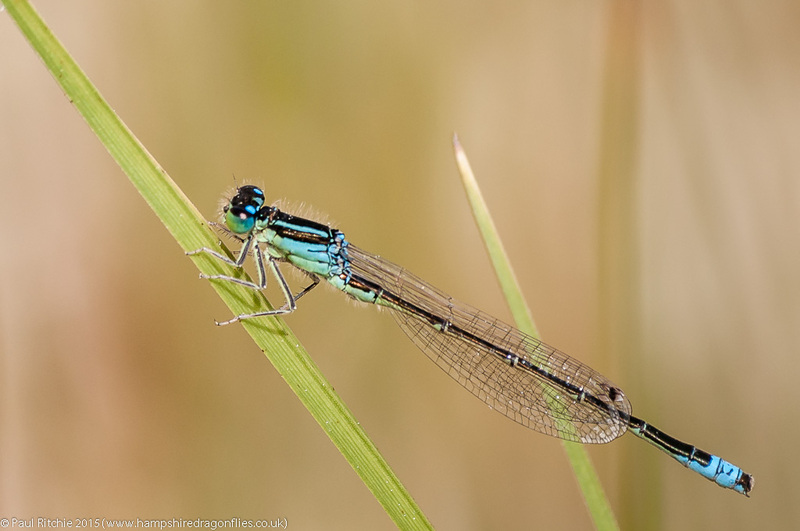 A few had been seen by Paul Winters a week back, and indeed have been present on site for a few years, but it was a welcome surprise to find them at this pool. 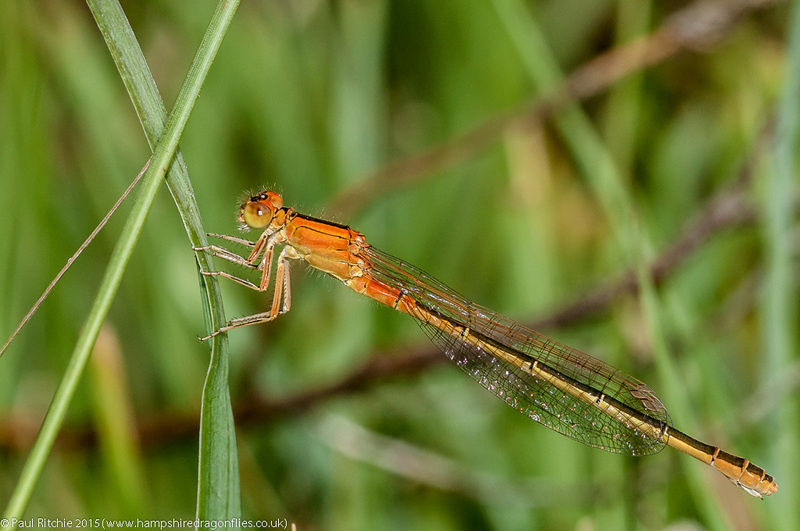 Several male, a mature ‘green’ female, another in transition and finally an immature aurantiaca. 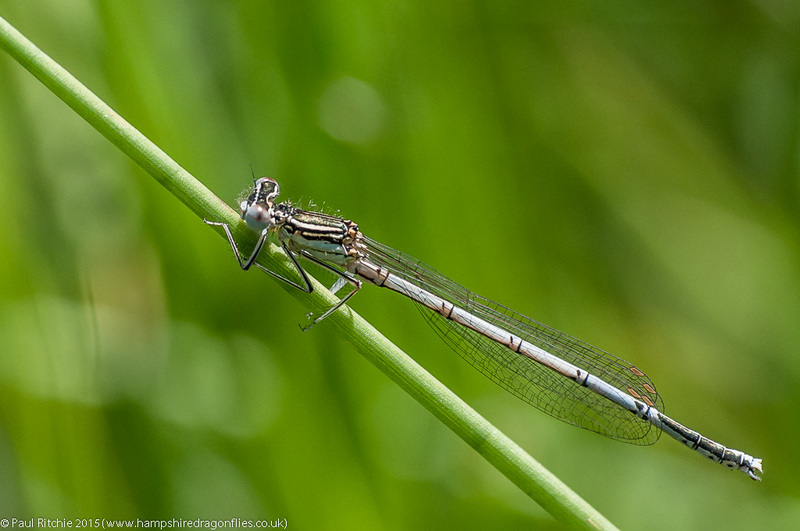 Following the channel from the small pool and along with the expected triumvirate of Common Blue, Azure and Blue-tailed, I found several more. They appear to have set themselves up a successful little colony here. 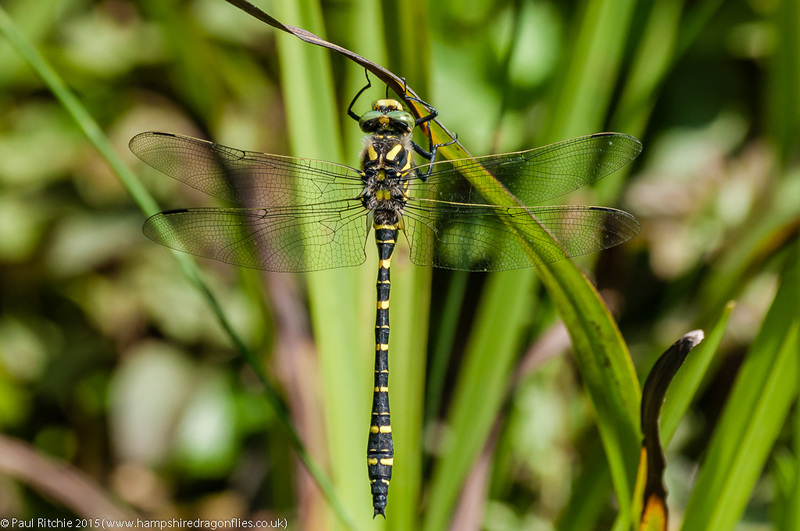 At another small pool a male Emperor entertained us for a while, joined briefly by a male Hairy and a female who chose to oviposit in the shadowed reeds. 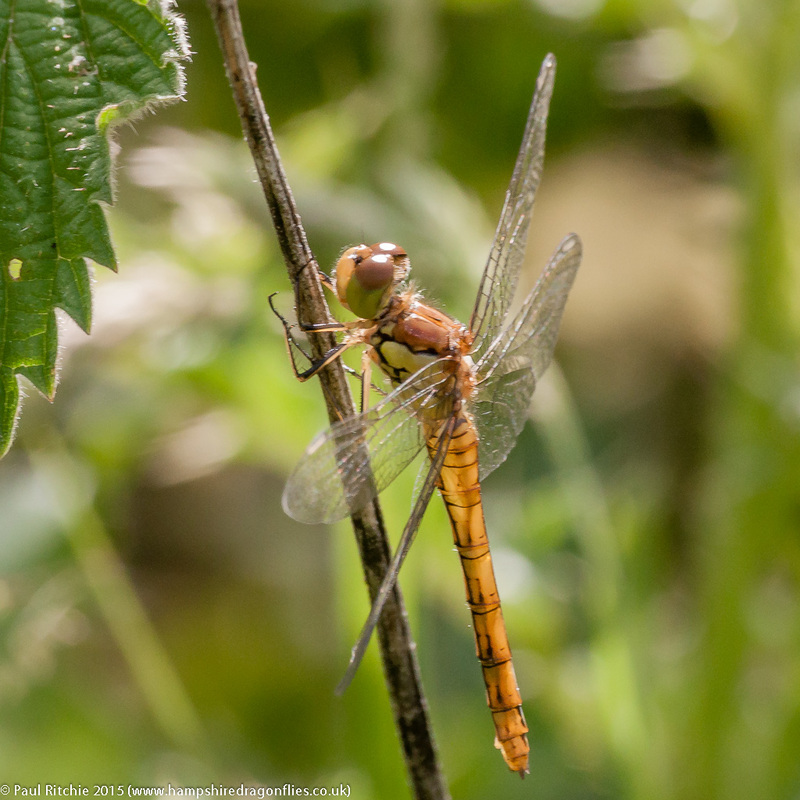 Further along in a small, grassy area was another teneral Common Darter. A male this time. As there was no further showings of our target at the pool, I took a wander around the site to get a navigational grounding for the season and caught a sight of another male Red-veined along the channel following the central path. Once again he was off before I could even raise the camera. Thwarted again! But at least I had a couple of sightings, eh? And, let’s face it, adding three species to the season’s count has got to be a successful day! 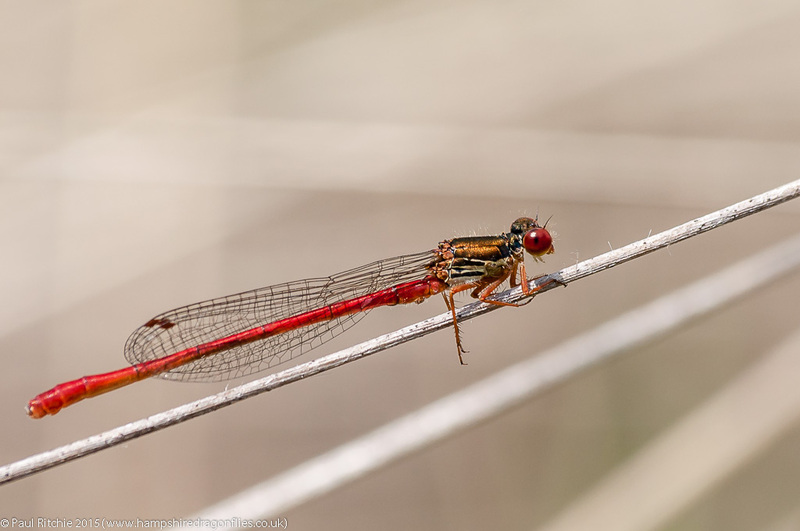 I can see why any reader of this blog gets the impression that everything is sunny skies and dragonflies, but as I’ve often pointed out I am certainly no stranger to miserable and unproductive days. We all get them, it’s just that I mostly choose not to write about them. I had one of those days this week; at a location which should’ve kept me busy all day, but the thick blanket of cloud curtailed virtually all activity. To me a good day is a day when you come home with at least 50 photographs to go through; or some damn good opportunities. I came home with eight, .and four of those were butterflies! So I’ll gloss over that, except to say that should you experience a crap day at any of the locations mentioned here or on the main site, don’t blame the messenger! If the conditions are wrong, you will have a lousy day. If however they are totally favorable, then you only have yourself to blame. On reflection this was a good day, despite wasting two hours searching for a new pond and finding it just as those clouds rolled in. Irritated by a navigational error and minimal sunshine stole my focus from what was a delightful find. What a pond! I spent the quieter moments getting a feel of my surroundings and what species were present. 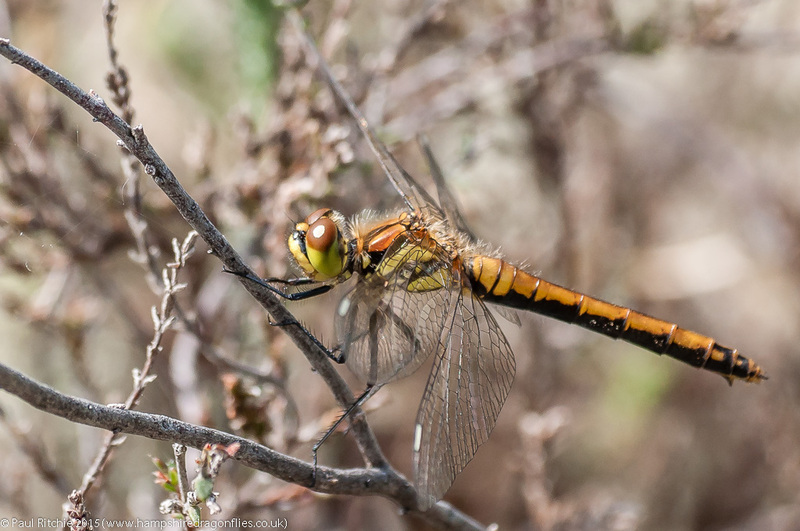 No surprises, but when it did kick off there was a fantastic display Emperor, Broad-bodied and Four-spotted Chaser, Downy, Large Red and Azure. At least half-a-dozen male and a couple of female Emperor vying for space; the females trying to offload their eggs under the presence of so many males was bound to cause some drama. During my stay I witnessed three Emperor pairings, several dog-fights, some with three participants, and relative peace as each claimed their own corner. I’ve heard it said by some that you will never get more than one male Emperor on a pond, which is of course ridiculous! Even a small pond can play host to many provided they each have a section of territory to protect out of each others view. This behaviour is shared by many hawkers deemed intolerant of others. The more individuals, the smaller the territory until a saturation point has been reached. A typical example of this can be found at Crockford, Ober and Latchmore with Golden-ringed. A single male will patrol a long length of stream; his territory diminishing with the arrival of more individuals. After the first disputes, each will choose their own section, any further conflicts happening upon trespass by those already present or new arrivals. 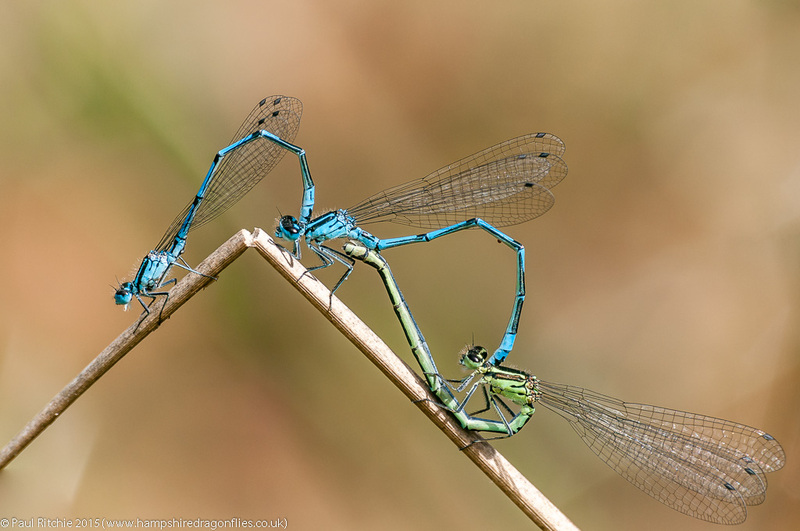 A bit like dragonfly photographers at Crockford! To begin with I thought I’d better call in at Cadnam Common as I’ve all but neglected it this season. 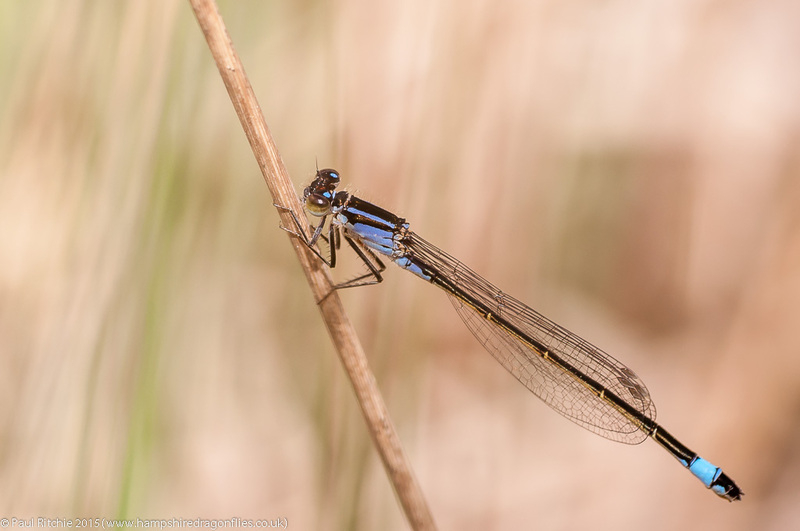 I expected a fine display of Chasers, Emperors and Downy, but the drought suffered last season allowed the grass to take root, stifling the shallow corners of the pond. What was once a wide, shallow area full of activity is now just a seepage, curtailing what activity there was to the deeper and less accessible section. I did however finally encounter a willing Downy. Weighing up the odds I decided to move on to greener pastures; that new pond was calling. Of course I couldn’t just take the route I’d established on Tuesday. Oh no, this time I wanted to find an easier route in. Naturally I ended up down deep and dark forest paths which wouldn’t be out of place in Grimm’s fairy tales, except the scariest thing for me was wasting valuable time! By a stroke of pure luck (maybe a little sense of direction) I eventually arrived via the gate! The immense thrill of relief as I looked again in case I was hallucinating. Narnia indeed. This was more like it. Once again a fine display from the Emperor, certainly the dominant species here. Besides revelling in the challenge of in-flighters, I witnessed three pairings. Each one of these I was lucky enough to follow. Not an easy task as Emperors seem most reluctant to be photographed in cop. Every time I’ve witnessed them, they usually fly out of reach, and are quick to be off again if you get anywhere close to them. After several stealthy chases I was finally able to get a decent photo; one I’ve been hoping for for may years. Now I could relax, and did precisely that; staying put at a chosen spot watching the fabulous display and grabbing a few opportunities. I needed a day like this. A day spent in one location without too much tramping and a reward for the trouble. A perfect set up for the next few weeks when a gentle stroll along Ober Water is in order. 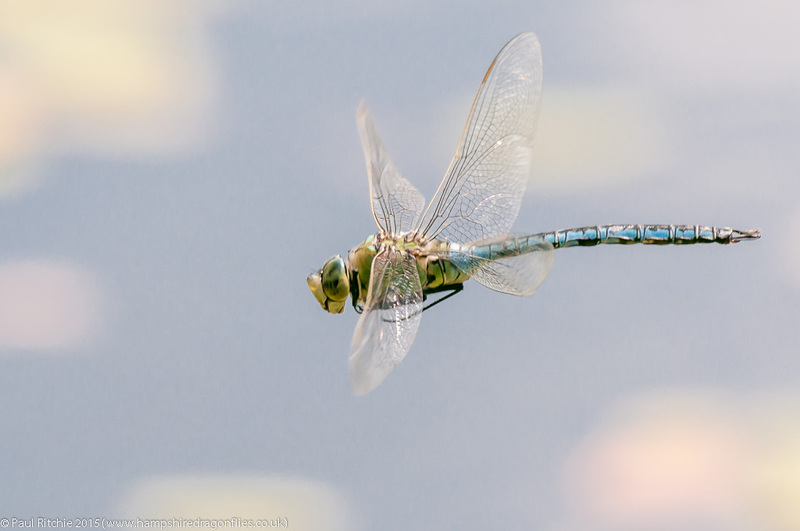 Of course the promise of a sighting or two of Small Pearl-bordered Fritillary should make the trip worthwhile, but it was those ponds I was more interested in, and I’m completely in dragonfly mode. Thankfully the latter didn’t disappoint. A gaggle of butterfly switchers were in the Eastern Clearing in search of the SPBF’s, and as we only saw the two ourselves; neither of which chose to stop. We did however have a sighting of an Emperor hawking and catching a Brimstone which he began to devour on the wing before deciding to perch low to finish his meal. Unfortunately the lack of stealth by one of the gaggle scared him up again and he decided the tree was a safer option. On to the ponds then, and while the dark pond had only Large Red and a surface scum of algae, the bench pond was showing more signs of life than it has done for many years. Not much, and a tad disappointing, but it needs a chance to get back in the swing of things. 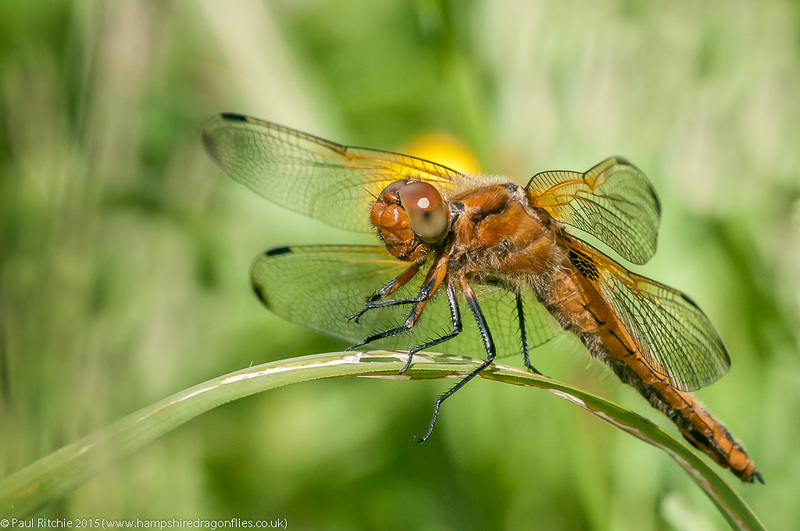 Today we had Large Reds in abundance, a fair population of Azure, just the one Four-spotted Chaser and a single Broad-bodied Chaser. I had hoped for Downy, but the timely arrival of a male Emperor, joyful in his youth and his acrobatic prowess, gave good sport for a while. 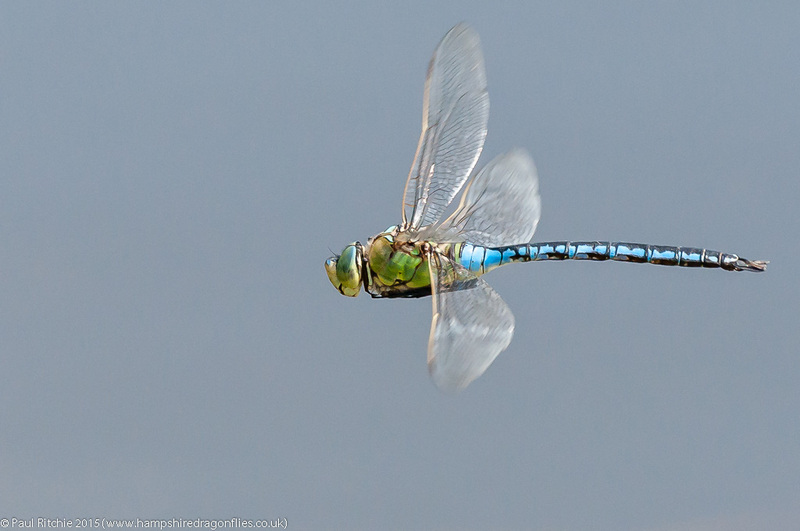 I’ve had easier, and this one was pushing every conceivable boundary of airspace while grabbing insects on the wing. Always a joy to see. Once again the dawdling passing of patchy cloud curtailed all activity so we made our way back to the Eastern Clearing. 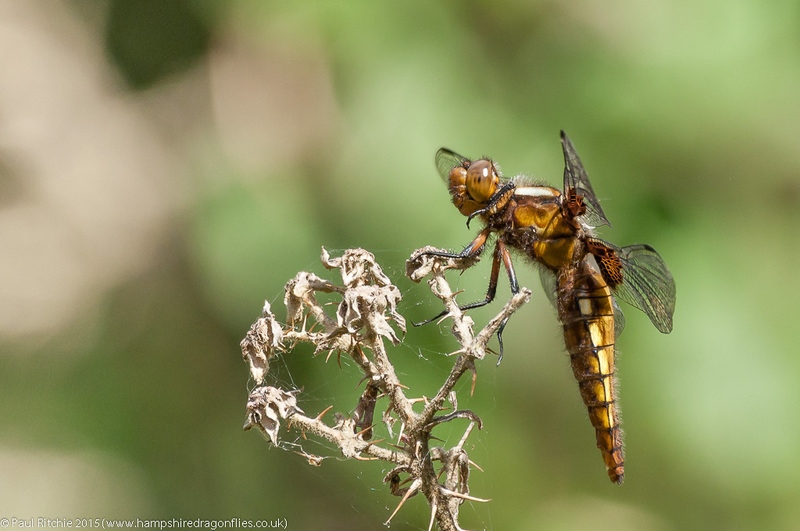 A female Broad-bodied Chaser was hawking the meadow, too nervous to stay put, and the Emperor from earlier was still in attendance, this time perching low down on a convenient stick, but buried deep in a stand of bramble. Not a lot then…but it was meant to be a butterfly day! 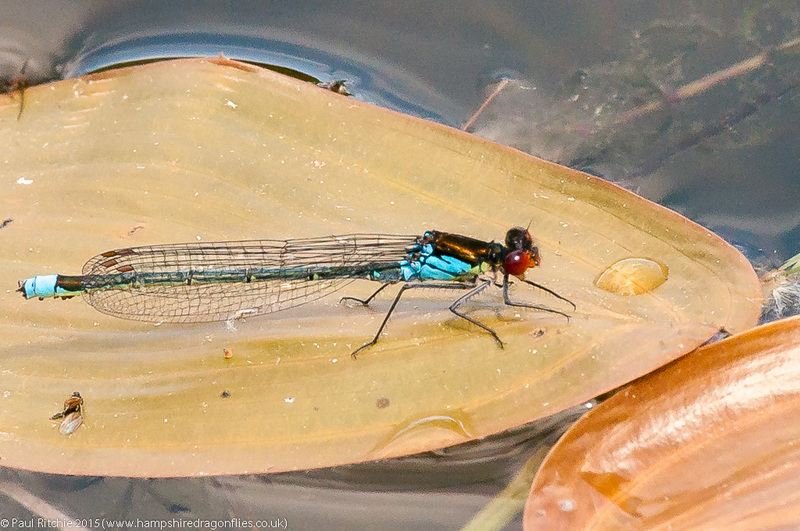 It should be worth a look in to those ponds in a week or two, but I’ve been seduced by another…. I had a call from Doug asking me if I wanted to join him at Dunyeats this afternoon. Although it has provided some surprises in the past, it’s not one of my favourite places – mainly because there’s always a band of dark cloud hovering over it with blue sky either side! Almost an improvement today, at least for a little while. Patchy cloud and occasional sunny spells to kick-start some pond action. 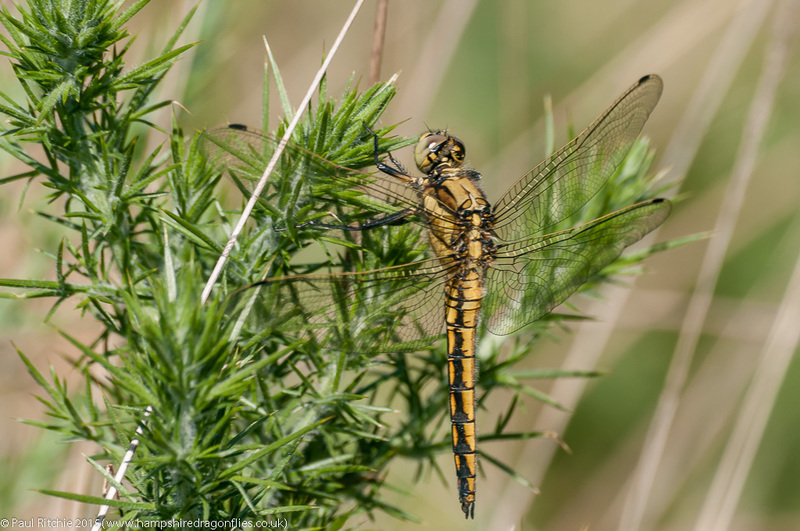 A couple of male Emperor, three Downy, several Four-spotted and Broad-bodied Chaser, Black-tailed Skimmers and the usual host of damsels, albeit in low numbers. 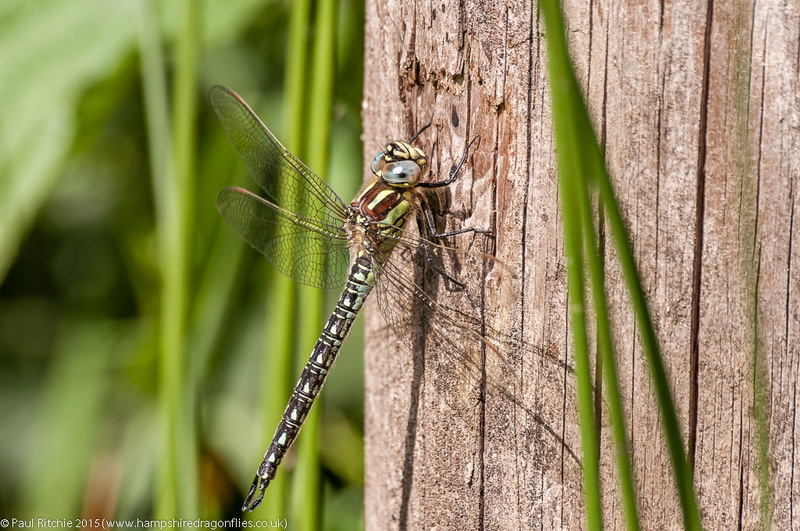 I busied myself with one of the Emperors while the sun shone. In true Dunyeats fashion (the Dunyeats curse?) the cloud increased and all the Downy and most of the others had retreated to shelter from that damn breeze (another Dunyeats trait). 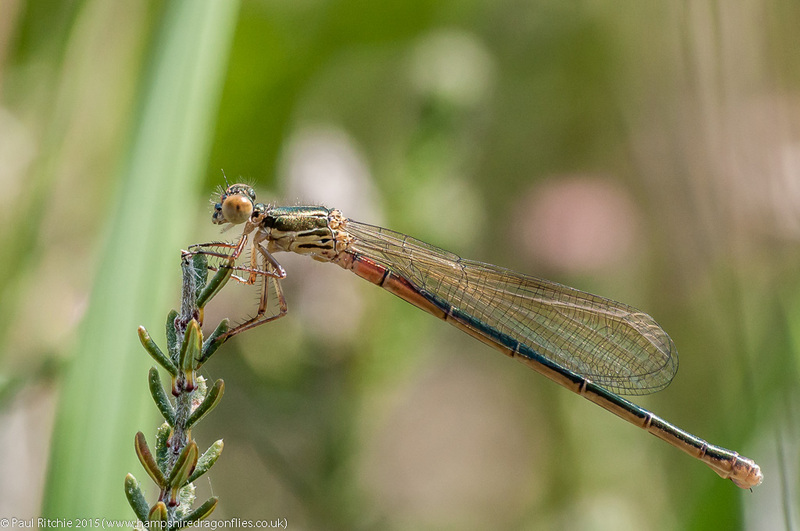 I searched the heath and found a few damsels near the surface, including this female Blue-tailed. 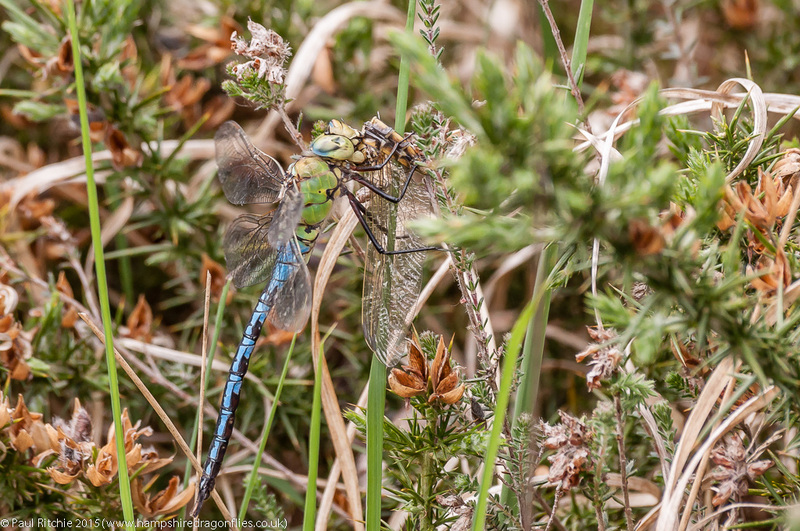 I also disturbed a male Emperor feasting on (possibly) a Black-tailed Skimmer and followed as he alighted with his prey. We decided to move on to Troublefield where at least there would be shelter and hopefully a surprise or two? Barely through the gate and we were entertained by a couple of hunting Emperor who proceeded to perch in the worst places possible, low down and invariably obscured by something or other. 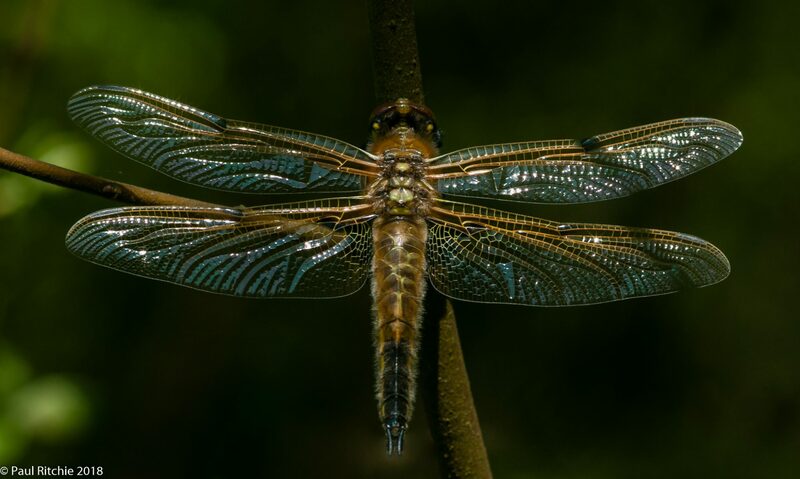 Besides the Emperor their were a fine display of both male and female Scarce Chaser. Moving to the river meadow I noticed something wasn’t quite right. Wide, cattle-flattened sections along the path(s) peppered with undesirable hazards which you certainly can’t lie down in. Ah well…it had to happen, and I’m glad it’s happened later, although they could have given it a tad longer? 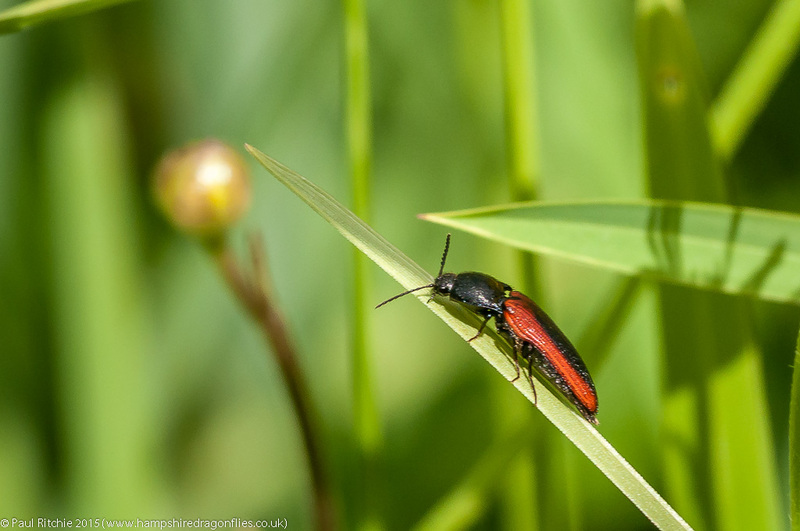 The results are already noticeable, with reduced populations of insects. Instead we decided to check the southern pastures. It wasn’t long before we claimed our prize – a fresh and beautiful immature Golden-ringed. Doug get’s credit for spotting that one, and the next welcome addition – a rather pristine male Hairy. Always a pleasure to find a Hairy on our home patch! A bit of catching up to do. After the success of Saturday and the promise of another pleasant day of sunshine, I decided to return to Bramshill. Being on my own I could seek out those other water bodies without getting Sue into any danger. Firstly let’s find an easier way into those ponds. There is; but I didn’t find it until a little later! I chose the hard way, but at least found the missing two ponds from Saturday’s visit. 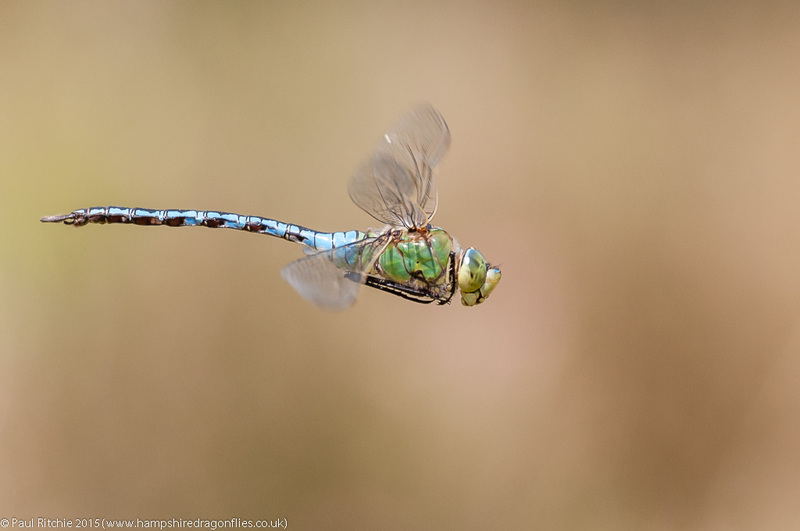 On the first of these were a selection of damsels, some Four-spotted Chasers and an Emperor. The best opportunity though came from a trio of Azures. Over on the other pools were much of the same, except the addition of a male Downy and a couple of male Hairy. I tried for a while with some in-flighters, but they proved to be just a little too far off. Leaving the clearing via the hidden door, I continued through to the large clearing where the dominant species were Black-tailed Skimmers. A few more Four-spotted Chasers and a couple of Emperors flew up at my passing and the grasses were peppered with damsels. Next it was Long Lake, where there was plenty of activity over the southern shore. I attempted to capture the Downy, but he was on a mission, taking the whole shoreline as his territory. So I opted for an Emperor instead. On through Emperor Alley, where the attendant clearings were somewhat subdued compared to usual; no doubt all out in pursuit of procreation. I did encounter a male Emperor at the end of the path and watched as he gave a fine hawking display over the crossroads at the end. I know I should’ve stayed put, but my reason for visiting today was further exploration; a decision I was soon to regret as I do tend to wander some distance. I did find several more water bodies, but non which appealed more than those I’d already found. There were a good few sun-traps along the way with some fine feeding displays. For once I didn’t get lost and finally found my way back to Long Lake where I busied myself with the Red-eyed. 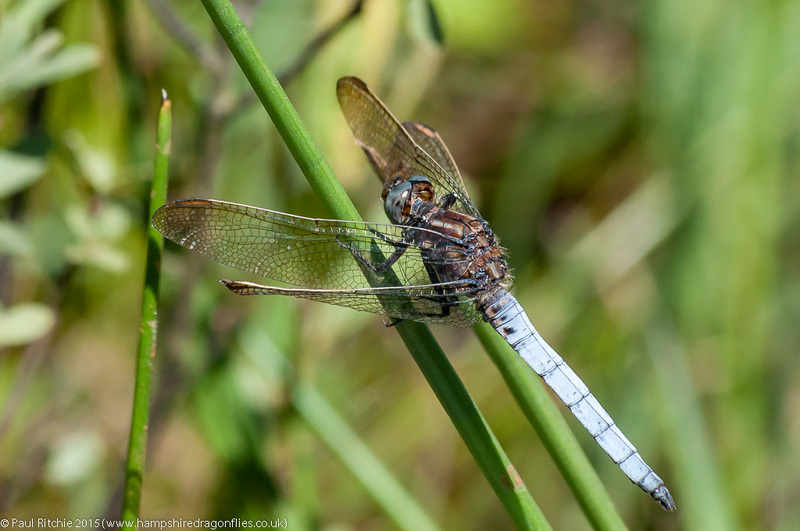 One more jaunt along Emperor Alley before returning to the ponds and a further excursion around the large clearing frankly wore me out, and I’d realised I’d overdone a little in this heat.Only another Black-tailed Skimmer offered an opportunity. I took my leave a little disappointed this time around. As I’ve said before, this site doesn’t share it’s secrets willingly. Since then I’m aware that my shot of the day came right at the beginning. Those Azures have caused a real storm on Flickr, 500px and even Facebook! Old habits die hard. Engaging auto-pilot at the first blast of June sunshine, I decided a ramble around Ramsdown was in order, possibly followed by a jaunt across Town Common. Let’s nip that one in the bud, shall we? Sensibly choosing Ramsdown first, the lack of action over the (newly-replenished) pools decided Town Common wasn’t worth the walk. 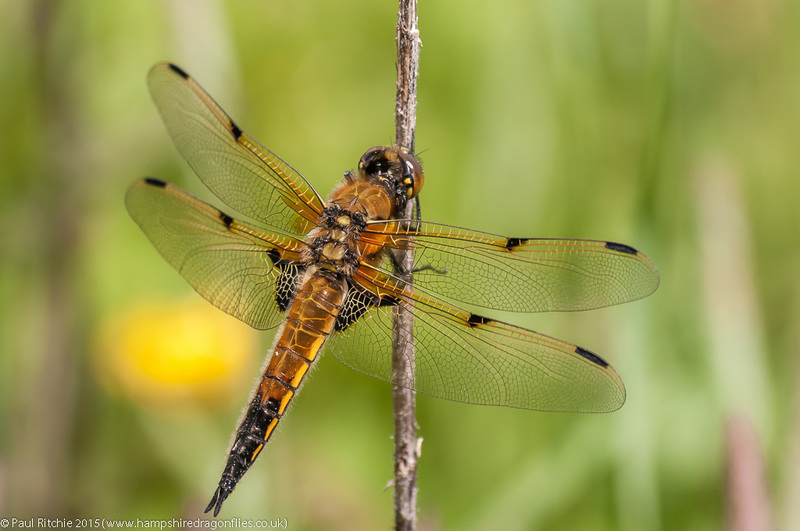 The first pond had a couple of Four-spotted Chasers battling for territory, the second only had Azure, and the pond on Sopley Common had a male Broad-bodied Chaser. 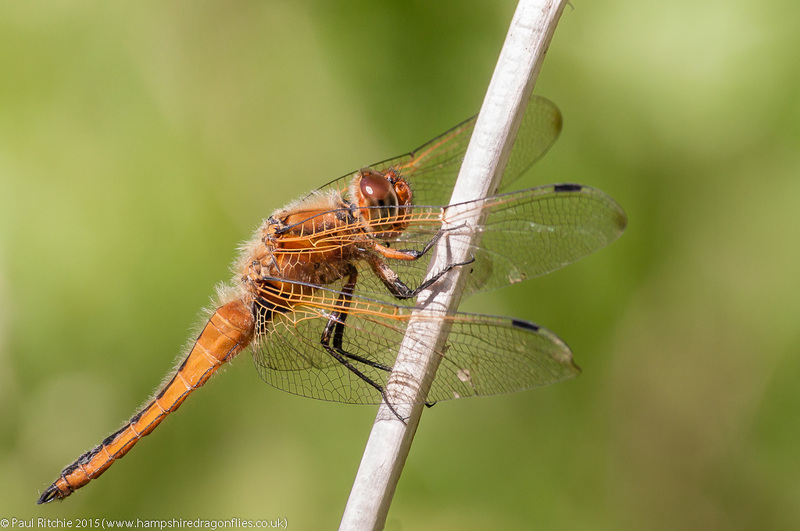 A female Four-spotted Chaser was ovipositing in the new pool, beginning the life phase in what I hope will turn out to be a valuable addition to the landscape. The heath didn’t throw up any of the expected surprises. I would’ve hoped to see a bevy of Scarce Chasers, a resting Emperor or two and possibly an early Golden-ringed, but not this day. That’s settled then – let’s go to Troublefield! Thankfully the recent heavy rain has delayed the cattle introduction (unless of course they’ve changed their policy?) 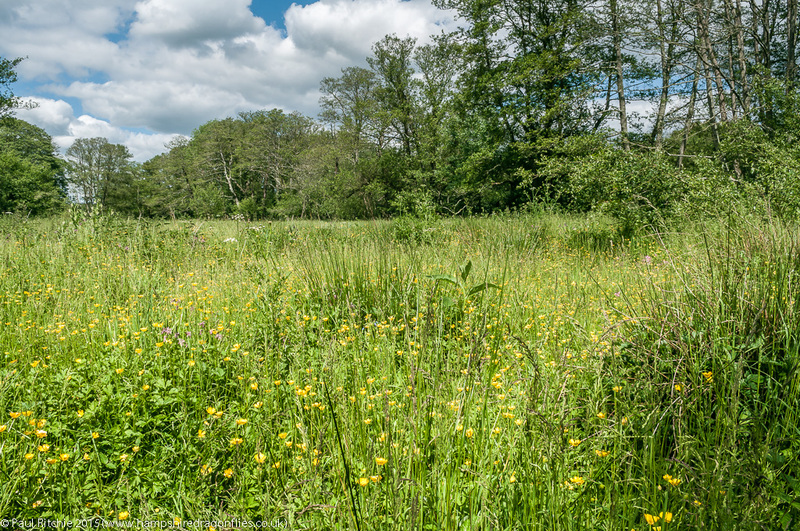 and the sight that greeted me was a lush, verdant growth of Spring water meadow. Fantastic! Put that damn bag down and explore! 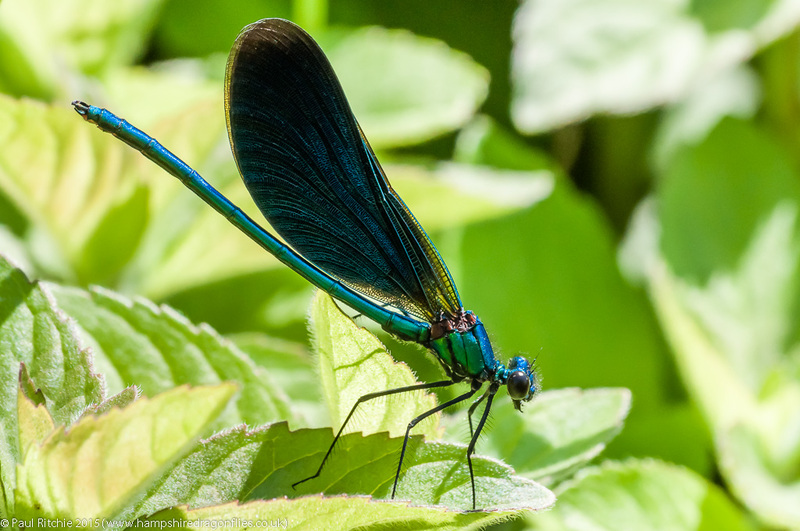 On such a wonderful day the meadow had far fewer Demoiselles than of late, but still enough Banded and Beautiful around to provide colour. The Brown Argus (looking a little faded now) were joined by Common Blue, Brimstone, Peacock, Small Tortoishell and Small Copper. 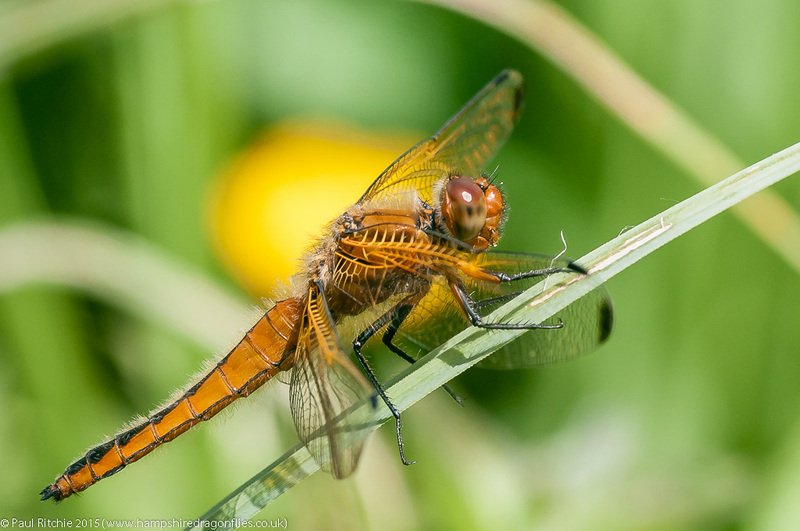 Besides the Demoiselles, the only other Odo’s present were Large Red, a timid Broad-bodied Chaser and did I mention Scarce Chaser? Yes, the beautiful, fresh citrus sparkle of half-a-dozen Scarce Chasers were the real highlight of this afternoon; the best showing I’ve had since Somerset. I normally scour Ramsdown for these, and still did earlier, but I needn’t have bothered. The setting of a water meadow far exceeds as a background than dry heath, and is more in keeping with their natural environment. It’s also far easier to pursue them! Towards the end of my stay, I noticed a fellow in the corner, followed by two companions. Paul (and Helen) Brock were here in search of beetle delights, showing an enthusiast from West Riding (John, if I remember correctly). It’s hard not to get enthusiastic when in the company of an expert. Books, TV and websites are all very well, but enthusiasm and infection in the field are the foundations of successful education.